Leak detectors of ZETCORR series are designed to detect and localize the fluids leakage in the pressure pipelines (petroleum pipelines and others), and for disclosure of the unauthorized connections and insets. portability and convenience in use. Leak detector of ZETCORR series consists of the correlator ZET 017-U2 and two leak detecting sensors BC 121. The sensors are mounted directly to a pipe, on the both sides of the supposed leak area. 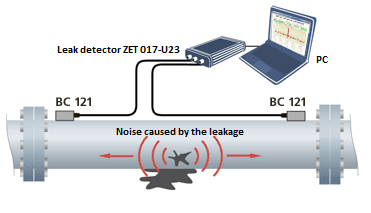 Correlator analyses the leak noise, incoming through the sensors, and with high precision detects the place of leak origin. In case of a leakage, the noise signal spreads in a full frequency range and in all directions. That signal decays in the ground and in the air, but it spreads in a pipe at the frequency inversely proportional to the diameter of the pipe (the bigger diameter, the lower leak signal frequency). That signal is registered by sensors ВС 121, mounted on the pipe, besides, the nearer the sensor is situated on the pipe, the sooner it will catch the signal. The time differences of the incoming signal indicate the leak by the Mutual correlation analysis of the signals program. Continuous correlation process allows to detect pulsating or weak leakage. It is possible to work in the mode of signal processing by time or to use fast Fourier transformation for the correlation. Correlators of ZETCORR series are portable leak detection systems. It can work in autonomic (without a computer) mode or in the continuous duty mode. When connected to PC, the correlators are powered by the computer. The ZETCORR system includes compact highly perceptible leak detecting sensors, with magnetic holder, the sensors connects directly to the correlator. The sensors are powered by the correlator too. Thus, ZETCORR leak detection system has extremely simple usage as its sensors are securely mounted on a pipe with magnetic holders on their bottom ends and connected directly to the correlator — the system is ready to use! The data are processed by specialized software, all you need is to indicate the sound spreading rate (speed of sound) in an environment (one time only). You can perform the data analysis in real time or with the help of previously recorded signals playback. Notebook or industrial personal computer. Data transmission from correlator to PC via Ethernet. Synchronization of the distributed system. The power supply comes either from the notebook once it is plugged to the notebook or from autonomic source in the autonomic operational mode. The sensors are powered by the correlator. Diagnosis carries out between two nearby sensors. Notebook is suitable for portable diagnostic systems, industrial PC is suitable for continuous monitoring systems.